Choosing the right products plays a huge role in your skin’s health. Paraben free products can help keep your skin at its healthiest. Here’s why. How would you react to a TV commercial encouraging you to slather your face with chemicals and preservatives every day in the name of beauty? The truth is that many of your favorite creams, shampoos, and cleansers likely contain parabens – chemical preservatives meant to protect the product from growing mold and bacteria. These chemicals have names like methylparaben, propylparaben, alkyl parahydroxy benzoates, and butylparaben, so they’re fairly easy to spot. Parabens are super common, but recent research has indicated that they may act as a xenoestrogen in the body. This means they imitate estrogen, which has been linked in some studies to contribute to hormonal imbalance and the growth of cancer cells. They have also been linked to a number of other unwanted side effects, such as brittle hair and advanced aging. Are you wondering if you have to either give up your beauty routine or run the risk of illness? No! There are an ever-growing number of paraben free products on the market that will keep you looking fabulous while protecting your body. These products offer a myriad of benefits for both you and the planet. Let’s take a look at the top 10 benefits you can enjoy when switching to paraben free products. Some say the data is not conclusive that parabens cause cancer. That being said, 99% of women with breast cancer sampled in a study had paraben in their tissues. Men are at risk, too, since paraben use has been linked to both cancer and lower than normal sperm counts in men. Introducing numerous preservatives into our skin each day surely cannot be beneficial. Our bodies are made to self-cleanse and remove toxins through the skin – the bodies’ largest organ. Products that contain unfamiliar chemicals, preservatives, fragrances, and dyes have the potential of building up in our tissues. Just as we should watch what we eat, we should pay attention to the ingredients we digest through topical use. The same creams sold in stores for their “anti-aging” properties may actually contain a type of paraben that makes you look older! Called methylparaben, this deceptive ingredient can cause a reduction in collagen, a protein that makes up a good portion of our connective tissue. Collagen offers benefits ranging from the appearance of youthful skin to easing joint pain. Natural alternatives to anti-aging creams include olive oil facial massages, phototherapy lights, steam treatments, drinking plenty of water, and an occasional egg white mask. Since the 60’s, allergic contact dermatitis has been an issue related to the use of parabens in personal products. Symptoms include excessive itching and red, blotchy patches or raised bumps on the skin. At some point, you have probably pulled a bottle of your “backup” shampoo out from under the bathroom sink when your favorite brand ran out. Even if it had been there for a questionable amount of time, it probably remained free of mold because of parabens. Is the ability to keep beauty products for unusually long periods of time worth the risk, though? Just as with your skin, paraben free products are better for your hair. Parabens can cause scalp irritations, and studies have shown that the use of parabens in shampoos and other beauty products result in blood and urine samples containing the preservatives after use. It probably comes as no surprise that parabens take a toll on the planet. When we rinse our products off at the end of the day, the water carries the residue of our products into the larger water supply – and eventually the ocean. Marine animals harboring parabens in their tissues have been discovered, which has prompted scientists and environmentalists to wonder if hormonal disruptions in sea creatures could affect their overall health. Land mammals are no exception – polar bears, sea lions, and marine animals have all been found to carry these synthetic parabens in their tissues. This is not a minor consequence. It can be argued that every product we use has the potential to impact the balance of nature. The health of your hair does not need to be sacrificed to the health of the world’s oceans. By choosing paraben free products for your hair, you are serving the welfare of the environment and the animals who rely on its protection. Have you heard the whole thing about how it takes 21 days to form a new habit? After just a few weeks of reading the labels on beauty products, you may be inclined to start proactively researching ingredients in other products you use – such as toothpaste, food, supplements, and beverages. You might be shocked at what you find: Additives, artificial dyes, chemical sweeteners, and fillers abound in nearly everything in a package meant for consumption or application. Luckily, there are numerous companies and stores that now cater to people looking for paraben free products, organic food, and natural alternatives. By changing just one habit, you may find yourself making healthier choices in multiple areas of your life. As you become more conscientious of the products you buy, you will likely start noticing that you need less than you ever imagined. One of the great benefits of paraben free products is you may stop purchasing extra items with paraben (cream for irritated skin, for example) to resolve an issue caused by – yep – paraben! Think about sustainability as a cool byproduct of the butterfly effect discussed above. Companies that care about what goes into their packaging probably put thought into the actual packaging. Here’s an example: If you’ve ever used a facial scrub with micro-beads, you were most likely massaging tiny plastic beads into your skin. When those go down the drain, they become part of the eight million tons of plastic TRASH that enters the oceans every year. Yeah, it adds up fast. It’s probably safe to assume that producers who replace the plastic beads in the name of sustainability will probably use recycle-able, recycled, or biodegradable packaging for their products. 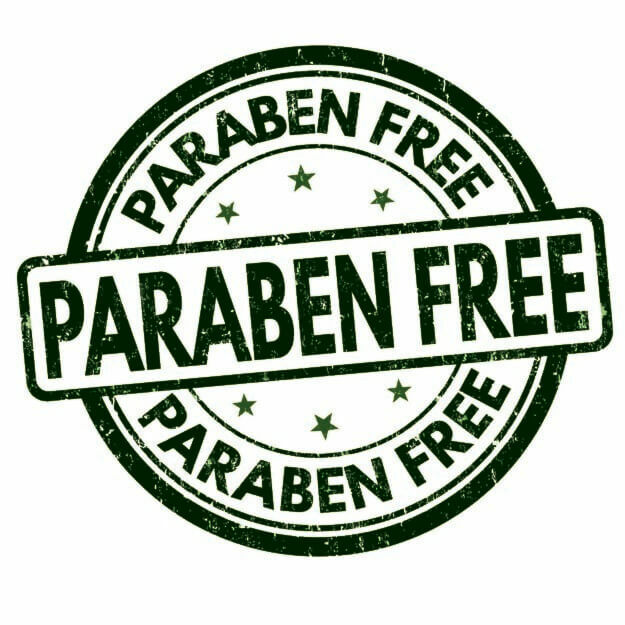 The paraben free products movement is not an isolated practice. Rather, it’s part of an overall strategy to support sustainable products for the health of our bodies and planet. That being said, the latest trends and products in the world of sustainable beauty are growing every day, so lack of selection will no longer leave you disappointed. Checking baby shampoo for parabens, for all the reasons listed above, is a good idea. If scientists don’t yet understand possible ramifications of life-long use of these xenoestrogens, why risk it? Again, we don’t know the extent to which parabens affect our health, but evidence certainly points to the side that says they do. The biggest benefit of paraben free products may be the fantastic feeling one gets when realizing they largely have control over what goes in and on their bodies. It’s time to feel fantastic (and knowledgeable) about the products you buy! To get started, simply look at what you already have in your own home. Replacing items one by one until you figure out the best healthy regimen for your needs is likely going to be much easier – and fun – than you anticipated. Welcome to the world of paraben free products!